A lot of amazing projects develop in unanticipated ways – seizing opportunities and exercising flexibility are key, and can have fantastic results. Arne Hillerns, President and Founder of Make Life Skate Life, demonstrated this when the EU Communications Team caught up with him in this blog post. Hello Arne and thank you for your time. Please could you give us a little overview of how Make Life Skate Life came to exist? Make Life Skate Life emerged as an organization in 2013 after our first skatepark project in Bangalore, India. The project came about after my friends and I met the Bangalore-based skateboarding collective Holystoked while traveling in India in 2012. They told us about their aspirations to build their own skatepark, for which they had already acquired land. My friends and I had experience building a community skatepark back in Germany so we naturally discussed the possibility of organizing a skatepark building workshop in Bangalore to teach the locals about concrete construction. A year later the Holystoked skatepark was built with the help of volunteers from all over the world. Since its completion, Holystoked has been spreading skateboarding through India by building skateparks all over the country. After the success of the project with Holystoked, it became clear that there were more opportunities to help skateboarding communities around the world realize similar projects so we created Make Life Skate Life. We have since completed skatepark projects in La Paz, Bolivia and Amman, Jordan. Wow, considering how young Make Life Skate Life is, you have been incredibly busy! Did you anticipate this level of growth and scale of projects when you launched MLSL? We’ve kind of just been taking things as they come, while always trying to look ahead and create the possibilities for future projects. Shortly after the India project, it became clear that we were going to do a follow up project in Bolivia with the same sponsor. After that, the opportunity to create a project in Jordan presented itself, so we jumped on it and made it happen. Since then we have been planning two upcoming projects in Myanmar and Ethiopia, while working on growing as an organization by expanding our network of project organizers, skatepark builders, donors, and volunteers so that we can make more and more projects happen each year. I’m not sure I anticipated this, but looking forward it’s easy to see the potential to scale up. How does Make Life Skate Life fund their projects? Our first two projects in Bangalore, India and La Paz, Bolivia were sponsored by Levi’s Skateboarding. 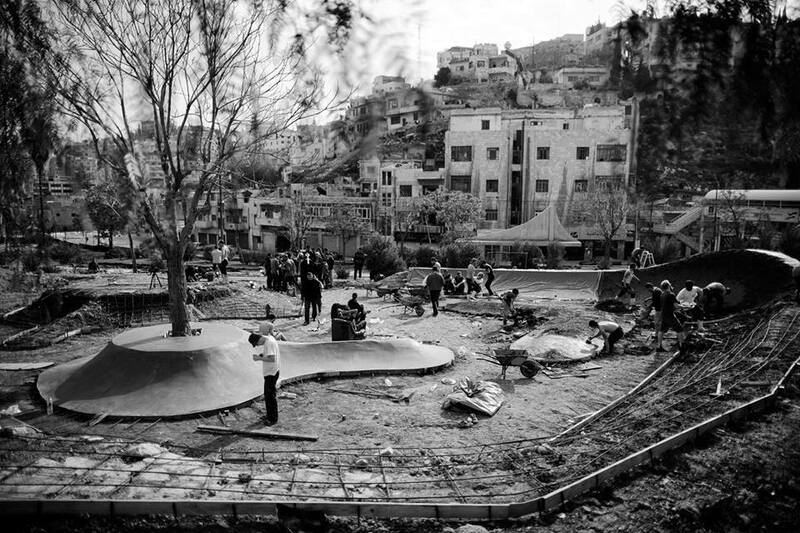 For our most recent skatepark in Amman, Jordan we crowd-funded the project through Indiegogo. We also plan to crowd-fund our upcoming project ‘Pushing Myanmar’ later this year. For future projects we hope to be able to connect with individual donors who are interested in serving a specific skateboarding community. How does MLSL choose where their next projects will be launched? It boils down to finding locations where building a skatepark will have the biggest possible impact. We build skateparks in places where there is a need, either for a local skateboarding community or at risk youth in general, in countries that do not have an existing infrastructure for skatepark construction. It’s a lot about making connections with active skateboarding communities. For example, there was a lot of attention drawn to the Burmese skateboard community through international media by the documentaries ‘Altered Focus: Burma’ and ‘Youth of Yangon’. The need for a skatepark in Yangon is very clear, but the city is not able to accommodate this need. After getting in touch with the skaters in Yangon we then quickly came to the conclusion that we wanted to develop a project together. How do you find working alongside government bodies and securing permission for projects? Are those bodies receptive and supportive? All of the government officials that we have worked with to secure permission have been incredibly supportive of our projects, and were able to anticipate the positive outcome of our projects early on. For all of our projects we are effectively donating a skatepark to the community, so once we’re able to get that across it’s hard for them to say no. The hard part is getting that initial meeting with the right person who can make it happen. Being a foreigner helps; so does showing a proven track record. Usually the local skateboarding communities have already been trying to work with the city to create a skatepark for years, but when we come in as foreigners we somehow manage to secure permission in a couple weeks. Pura Pura Skatepark has also become a venue for cultural events and educational workshops – what’s your favorite part of seeing the long-term impacts of your projects? On each project we’ve completed, local partner organizations have been eager to develop social programs and activities, each in their own way. We do not apply any sort of fixed model to each of our projects, rather we seek to provide the infrastructure necessary for locals to take over and decide how to best serve their community. At the Pura Pura Skatepark in La Paz, Bolivia, we also constructed a community youth center next to the skatepark with funds from the Germany Embassy in Bolivia. The youth center is now used to operate a skateboard equipment loaner system and to offer skateboarding classes, supported locally by German NGO Soforthilfe La Paz and the youth-led grassroots skateboarding organization Asociación de Skateboard de La Paz. A different approach has been taken by the locals at the 7Hills Skatepark in Amman, Jordan. Aside from free skate sessions with loaner boards, the skatepark is used as a venue for locally organized skateboard competitions, street art exhibitions, music festivals, and other events. The locals have taken ownership of the project from day one and turned the skatepark into a venue that the whole community benefits from. Would you have any advice for students who were hoping to launch their own non-profit organizations after finishing their studies? Create a project that you are passionate about and go for it. I see a non-profit organization as a means to enable you to do the projects you want to do to affect a positive change in the world. We have been working on a project to create the first skatepark in Addis Ababa in coordination with Ethiopia Skate, a grassroots organization that promotes skateboarding in Ethiopia. We are also planning to launch a crowd-funding campaign in September for ‘Pushing Myanmar’, our project to create a community-built skatepark in Yangon, Myanmar, hopefully in November 2015. Both Yangon and Addis Ababa have active and rapidly growing skateboarding communities that are overdue for a proper concrete skatepark. It’s sort of hard to think beyond two future projects, but we will continue to take things as they come. There are a lot of project opportunities out there and we’re excited to see what the future holds for us. If you want to check up on our progress, visit our website Makelifeskatelife.org and follow us on Facebook/Instagram @makelifeskatelife. If you’ve got an idea for a project, shoot us an email at [email protected].